TribeologyBlog.com – Episode 637 – How is the Hotdog Made? Your customer walks in the store, they’re hungry. You sell hotdogs. Which will generate the higher sales… focusing on the satisfying the customer’s hunger or telling them how the hotdog is made? However, let’s keep this very short and simple example in our heads as we create our story about our product. YES… you need to create a story. At our family marina we have a great service where the customer’s boat is kept in our warehouse and with a one hours notice we put the boat in the lake “valet style”. This sells the features of the service. The benefits are that the boat stays clean and it is safe from wave damage in the storms. Well, both of these tactics, features/benefits are helpful… it’s the story that, “all you do is pack your cooler and hit the waves” that’s feeding the customer’s desire. We could tell the customer it’s convenient or easy… but letting them do the work of imagining a sunny day, packing a cooler with ice, food, and drinks, and leaving shore is what will sell THEM on the service. Allowing the customer to jump into the story, meaning they visualize them selves in the story is much more effective than telling them how the hot dog is made. This style of story marketing also helps with your tribe building… why? Well, you are teaching customers HOW they will be able to use your product. So from before “day one” they begin to trust you. 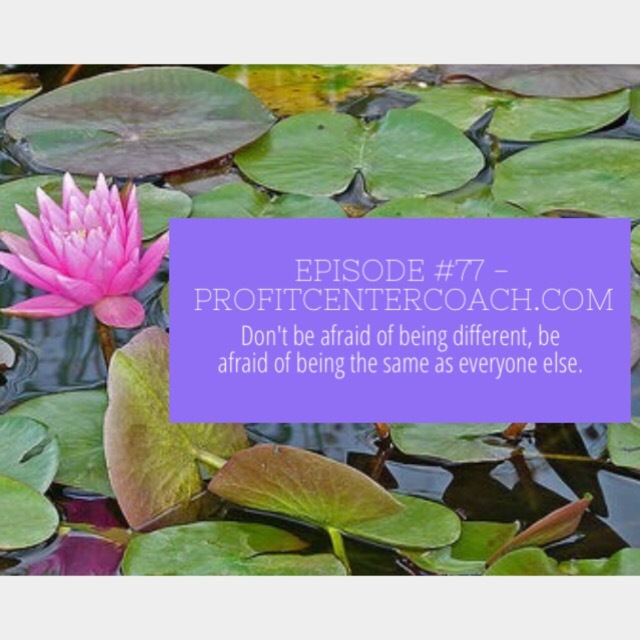 Episode #77 – You Be You But Never Compete on Price! It’s time to set yourself apart in the marketplace, but don’t do it on price!!! I mean when you’re shopping, don’t you find a product and then head to Google and search for it to find the best price. And that’s great for the business if they can compete on volume. For most vendors, however, competing on price just sets you in a race to the bottom and out of business. There’s a lot of pressure to lower prices because customers ask for it, but honestly, in my experience, don’t do it. You priced something because your time is worth something. Hopefully, by this point you’ve determined what your time cost is to make something and you’ve factored it into the price. If you have not, make sure to figure this out! If you find yourself overwhelmed with no free time and resenting your customers, it’s because you forgot to pay yourself. It’s fun to look at other companies and see that you can sell something for less than them, but honestly, if that other company has been around a while, they likely know something you don’t. Use their pricing as your model not your weapon. If you need another reason why you can’t compete on price… send me three dollars. That’s right. You reach into your wallet, pick out three dollars and send them to me. Well… if you give someone a discount, that’s exactly what you are doing! Remember you can’t compete on price because you’re ripping yourself off. This is reason to avoid the race to the bottom! People will ask for discounts. When you give a discount you are actually giving the person money out of your own pocket. WHAAAAAT????? Seriously! That’s what they are saying. Do not compete on price. Compete on value. There’s a reason everyone in the market is charging a similar price, because that’s what it costs to provide the product or service! What I encourage is to compete on your Unique Value Proposition! What is it that you do or create that is unique? Focus on the thing that only you provide. Is it a color, shipping style, bundle, after sale service, unboxing, “the next step” – what is it that makes your business unique. That is what you need to sell! We just admitted that we all go to Google for price, you need to make your website attractive and trustworthy and you need to sell your story. Create the Unique Value Proposition so you are the “go to” for the sale! PS: if you love my post, “Like” it! 1- What is your Unique Value Proposition? Spend some time brainstorming what it is that you already do (or can do) that your competitors do not do… This can be as simple as creating your “3 Point Super Service Policy” and come up with three points. I’m not kidding… haven’t you taken your car to get serviced with it’s “30 point service inspection”????? 2- Start marketing your Unique Value Proposition!! !